This range of high voltage power supplies from Consort meets all modern requirements for electrophoresis. There are ten models to choose from, all with the same great features, quality engineering, and attractive pricing. In Manual mode you set the voltage, current and time, and you can change these parameters during the run. Up to 9 different sets of frequently used parameters can be stored in the non-volatile memory for future recall. Simply select the corresponding program number and press RUN. Each program has 9 steps, providing a flexible multiple step function for special techniques. A linear voltage ramp can be programmed for any step provided the limiting power or current is not reached. Timer or volt-hour controlled operation is a useful standard feature on all models. The microcomputer will automatically terminate the run and sound an alarm when the count down of the selected value is achieved, or go on with an other set of parameters, when the running program recalls the next one. Possible drop outs of the line power have no influence as the instrument will automatically continue the run for the remaining time or volt-hours. Reads voltage in 1 V steps. Reads current in 0.1 or 1 mA steps. Reads power in 0.1 or 1 W steps. Constant monitoring of running parameters terminates the run in the event of abnormal changes. 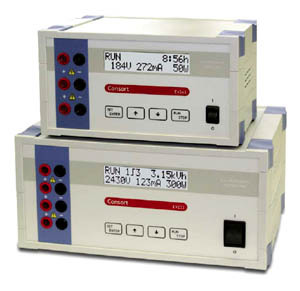 Stores up to 3600 output values.- voltage, current, and power, time or volthours. Each model has constant voltage, constant current and constant power capabilities with automatic cross-over. Special limit controls indicate which parameter is kept constant. The user is protected from potential shock hazard since the AC line is automatically disconnected from the high voltage transformer when a ground leakage path is detected. The instrument is fully protected against any overload condition including accidental short circuit of the output. The high voltage cannot suddenly appear at the outputs. It will always increase smoothly until one of the pre-set limits is reached.